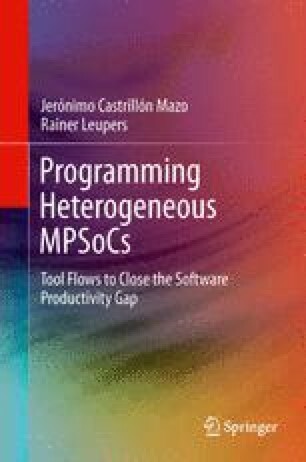 Chapter 1 explained how heterogeneous MPSoCs for high-end applications will continue to have hardware acceleration and specialized processors in order to meet tight energy constraints. For such platforms, the software compilation approach of the previous chapter would not leverage all the computing power. As a consequence, the performance of an automatically generated implementation would lag orders of magnitude behind an optimum manual design. This chapter presents an extension to the parallel flow that accounts for such optimized platforms. The extensions target applications from the SDR domain, thereby solving the SDR problem from Def. 2.57.